On March 23rd, nine Wheaton students drove to the University of Rhode Island Diversifying Individuals Via Education (D.I.V.E.) conference to collaborate with other students who were interested in learning how to break stereotypes and bring intercultural techniques to college campuses. Colleges from all over New England gathered together to learn about pertinent issues involving race and ethnicity inclusion in higher education. Wheaton students participated in conversations that explored race relations, student leadership and social change, institutional barriers, community building and intersectionality and diversity. Students who attended the D.I.V.E Conference. Photo submitted by Sydney Murphy. Accomplished actor and singer/songwriter, Bryan Terrell Clark, presented his own experience with stereotypes in the performance community as the keynote speaker. He has performed in hugely successful Broadway shows like Hamilton. Clark is a co-founder of Indefined, an online apparel brand whose initiative, which launched in 2017, inspires and teaches young people to use their voice to erase constructive labels in our society. “I felt connected to Clark in his passions and his ethnicity. His presentation was motivational and showed me that there are no limits to my capabilities. I should live authentically and live within the realms of my truth,” said Kelby Perez ’20. This was Perez’s second time attending this conference, and he hopes to go again in the future. There were many different guest speakers who spoke motivationally about self-love, authenticity and individuality. “My favorite part about the D.I.V.E. 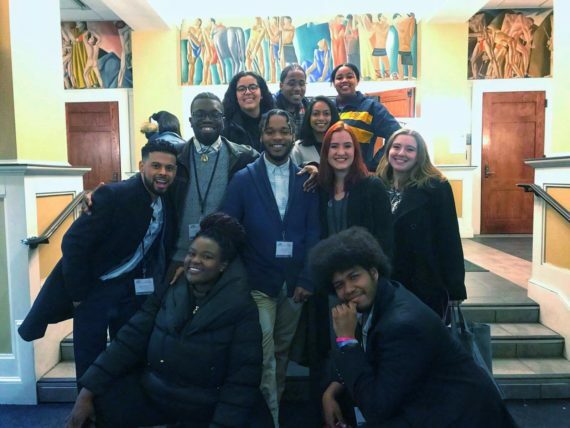 conference at the University of Rhode Island was the sense of pride and empowerment students had while creating and maintaining a conference dedicated for students by students for students!” said Andru Anderson ’19. The speakers also talked about intersectionality and prevention of microaggressions. “The people at D.I.V.E. were incredible! I loved the speakers and the sessions. I think it is a great way for other students to learn about the impact they can have and how to advocate for themselves,” said Destiney Fry-Daly ’22. “My favorite part of the D.I.V.E. conference was interacting with other students who are also working towards making their campuses diverse and inclusive,” said Gabrielle Astacio ’21. The students attending the conference are all leaders in their communities and are passionate about bringing diversity back to their own institutions. “My favorite part of D.I.V.E. was meeting phenomenal people, not for networking and career connections but for how beautiful they are, the impact they had on you and what they could mean to you years after the encounter,” said Kneeco Hanton ’21. Every Wheaton student who went to the D.I.V.E. conference is very thankful for the opportunity to be a part of such an important movement. “I could tell that the entire D.I.V.E. team put a lot of heart and hard work into the conference because it showed in the speakers as well as the sessions that I thoroughly enjoyed!” said Yassmine Raoui ’22. The conference not only educated students but also gave them the tools to lead the way in promoting more diversity in their own campuses. “I found the D.I.V.E. conference very enlightening. Leadership is very selfless and I learned how important it is to take care of yourself while leading others,” said Caroline Goodwin ’21. The D.I.V.E. conference is just one step towards making Wheaton College an intersectional and diverse campus.